The Shea Butter we use in our soaps is organic and unrefined, not chemically processed in any way. This is the same raw butter we use in our salves, lotions and soaps. Shea Butter is estimated to be 12-15x more moisturizing than cocoa butter, and can penetrate all layers of our skin. It is a terrific natural moisturizer and is reported to reduce age spots and wrinkles, 'plump up' skin tissues for people on blood thinners and other medications, and reduce development and thickness of scar tissue. These first-hand reports aren't just in publications - we've heard them from our own customers. Our Shea Butter is harvested in various regions of Ghana by a Womens' Cooperative. Because it may be collected and processed at various times during the harvest year, and therefore can be various shades of cream or ivory beige color. 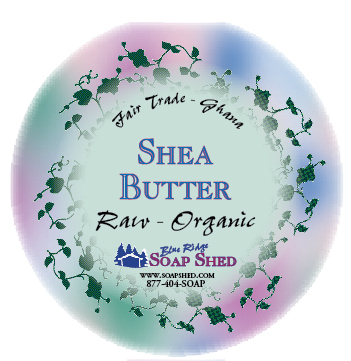 Shea Butter that is organic and unrefined, not chemically processed in any way. This is the raw butter we use in our salves, lotions and soaps. Our Shea Butter is harvested in various regions of Ghana, and also at various times during the harvest year, and therefore can be various shades of cream or ivory beige color.